Nationality: American. Born: Newark, New Jersey, 4 July 1924. Education: Attended Delmar High School, New Jersey; Bowling Green State University, Ohio, B.A. 1946; Actors Studio, New York. Family: Married the director Jeffrey Hayden, 1951, son: Darrell, daughter: Laurette. Career: Acted on radio in New York, including the serial One Man's Family , and later in TV version, 1950–52; 1953—role in the Broadway play The Trip to Bountiful ; 1954—film debut in On the Waterfront ; later worked on stage and television, sometimes directed by Hayden; 1986—in TV mini-series A Year in the Life ; 1987–88—appeared in TV series Moonlighting ; 1990—in TV mini-series Voyage of Terror: The Achille Lauro Affair and People Like Us . Awards: Best Supporting Actress Academy Award, for On the Waterfront , 1954; Emmy Award, for People Like Us , 1990. Agent: Kohner Agency, 9300 Wilshire Boulevard, #555, Beverly Hills, CA 90212, U.S.A.
Interview with Michael Buckley, in Films in Review (New York), May 1983. "Saintly Speaking," interview with D. Freeman, in Emmy (North Hollywood), August 1992. Current Biography 1955 , New York, 1955. Bulnes, J., "Les Immortels Du Cinema: Eva Marie Saint," in Cine Revue (Brussels), 10 March 1983. Buckley, M. "Eva Marie Saint," in Films in Review (Denville), May 1983. Marill, A.H., "Eva Marie Saint's Films," in Films in Review (Denville), May 1983. Limbacher, J.L., "Saint," in Classic Images (Muscatine), July 1987. 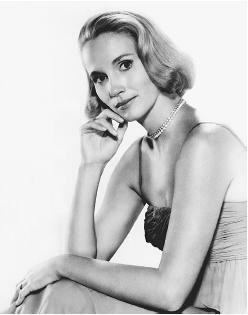 In one sense, Eva Marie Saint is the perfect example of a talent that Hollywood never quite figured out how to use. Her career failed to develop in any confident direction after she won an Academy Award for her first film, On the Waterfront . To paraphrase Marlon Brando's famous line, "she should've been a contender." In almost all her films, Saint has been presented as an outwardly vulnerable, fragile woman who possesses a surprising inner strength. This image has carried her through a series of roles as either a supportive wife ( A Hatful of Rain ; All Fall Down ; 36 Hours ; The Russians Are Coming, the Russians Are Coming ; and Loving ) or a determined, resourceful mother ( The Stalking Moon , Loving , The Best Little Girl in the World , and The Macahans ). Only Alfred Hitchcock employed the reverse of this image, casting Saint against type as an outwardly strong woman with a hidden vulnerability in North by Northwest . While never cast in a role of central importance, Saint has frequently highlighted the talents of the men with whom she has starred. Her ability to pay attention, show interest, and respond has made many actors look very good indeed. Don Murray's strongest scenes in A Hatful of Rain are those with Saint, actually interacting with her instead of simply reciting monologues for the camera. Warren Beatty's initial recognition as a serious actor occurred when he appeared opposite Saint in All Fall Down . Gregory Peck's role as a resourceful Westerner in The Stalking Moon was made particularly poignant by Saint's portrayal of a complex woman who merits his protection. Perhaps George Segal's best work was in Loving with Saint. Ironically, Bob Hope recognized and used Saint's ability to make an actor look good and charge a film with believability in That Certain Feeling and Cancel My Reservation . Following the latter, Saint has had little opportunity to show her acting skill on the big screen. Mostly, she has valiantly risen above the largely inferior television productions that predominate her late-career filmography, with only occasional forays back to the screen, such as the underdeveloped role as mother of Tom Hanks and wife of Jackie Gleason, whom she leaves after 36 years of marriage, in Nothing in Common . Her better television performances include her wife of a Vietnam prisoner-of-war in When Hell Was in Session , her convincing portrayal of Marilyn Klinghoffer in the mini-series Voyage of Terror: The Achille Lauro Affair , her Emmy-winning role in the mini-series People Like Us , and her grandmother (alongside Jason Robards's grandfather) of Jim Burden in the adaptation of Willa Cather's novel My Antonia . Saint also had a widely seen, although only occasional, role as Cybill Shepherd's mother in one season of the television series Moonlighting .